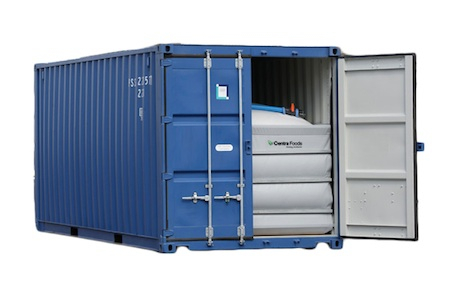 A container of olive oil that is comprised of a removal bladder inside a conventional shipping container. This bladder has a built in valve, that a pump can connect to, to remove the oil. The amount of olive oil put into this container is flexible, hense the name. At it’s maximum, it holds approximately 42,000 lbs or 6,000 gallons. These flexitanks save a lot of money over the totes and drums by removing packaging and domestic LTL shipping costs.